WASHINGTON/SEOUL—Talks between the United States and North Korea are headed in the right direction, a top U.S. envoy said on Friday, June 1, ahead of a rare visit to the White House by a senior North Korean official. 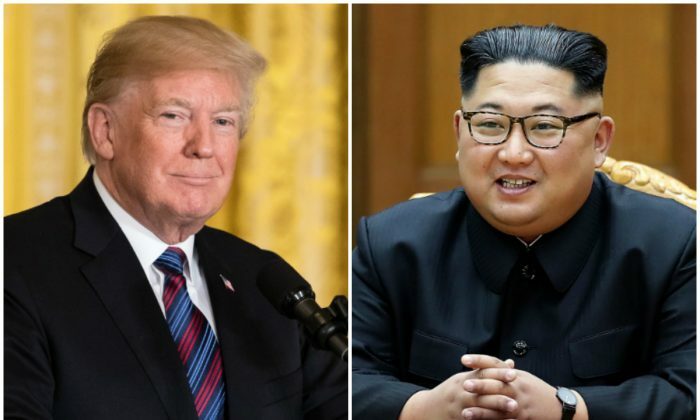 At a planned meeting with U.S. President Donald Trump in Washington, Kim Yong Chol, a close aide of Kim Jong Un, will hand over a letter from the North Korean leader as the two sides try to put a derailed summit meeting back on track. Trump hopes to meet Kim Jong Un in Singapore on June 12 and pressure him to give up his nuclear weapons, although he conceded on Thursday that might require more rounds of direct negotiations. In Seoul, U.S. negotiators expressed optimism after meeting their North Korean counterparts for preparatory talks at Panmunjom, on the fortified border between the two Koreas. “We believe that we’re moving in the right direction to the ongoing series of consultations, including (U.S. Secretary of State) Pompeo’s engagement with Vice Chairman Kim Yong Chol … our discussions at Panmunjom and of course the discussions in Singapore as well,” U.S Ambassador to the Philippines Sung Kim, a veteran diplomat and expert on North Korea, told South Korea’s foreign minister, Kang Kyung-hwa. The discussions in Panmunjom have focused on possible agenda items for Trump and Kim, while meetings in Singapore are more focused on logistics, officials said. In a separate high-level meeting on Friday, officials from North and South Korea agreed to hold talks later this month on military issues and reunions of families separated by the 1950-53 Korean War, they said. It was not clear what North Korea’s leader wrote in his letter to Trump, and White House spokesman Hogan Gidley said late on Thursday that the details of the meeting in Washington were still being worked out. Pompeo is slated to meet Trump at the White House at 1 p.m. local time. After trading threats of war last year, the two men agreed to meet for an historic summit on June 12. But Trump cancelled last week, citing Kim’s “tremendous anger and open hostility” in a string of public statements. Even as he pulled out, though, Trump urged Kim to “call me or write” if he wanted to revive the meeting. Within a day, both sides were in new talks to save the summit, and Kim Yong Chol flew to New York this week to meet Secretary of State Mike Pompeo, raising hopes that the summit might be back on. Despite saying the two sides made “real progress”, Pompeo also cautioned that there might be no quick solution. “They’ll have to choose a path that is fundamentally different than the one that their country has proceeded on for decades. It should not be to anyone’s surprise that there will be moments along the way, that this won’t be straightforward,” he said. North Korea’s nuclear weapons program has made significant advances in recent years and poses a threat to the United States. Trump’s main goal in any talks is to eliminate that threat. Kim has rejected previous U.S. calls for North Korea’s unilateral nuclear disarmament and argued instead for a “phased” approach to denuclearization of the entire Korean peninsula. That in the past has also meant removal of the U.S. nuclear umbrella protecting South Korea and Japan. In Pyongyang, Kim hosted Russian Foreign Minister Sergei Lavrov on Thursday, while a Kremlin spokesman told reporters a summit between Russian and North Korean leaders could take place. During his meeting with Lavrov, Kim said his will to see denuclearization on the peninsula remained “unchanged, consistent and fixed” and hoped improved North Korea-U.S. relations would be solved on a “stage-by-stage” basis. The North Korean visit to the White House on Friday will be the first since 2000, when President Bill Clinton met senior figure Jo Myong Rok in an unsuccessful attempt to win the reclusive nation’s nuclear disarmament. They met for 45 minutes and Jo brought Clinton a letter from Kim Jong Il, the late father of North Korea’s current leader. Jo wore full military uniform when he was with Clinton, then donned a business suit to meet then Secretary of State Madeleine Albright. To make his trip this week, Kim Yong Chol needed special permission for travel to the United States because he had been blacklisted. South Korea has accused him of masterminding deadly attacks on a South Korean warship and an island in 2010, and U.S intelligence linked him to a cyber attack on Sony Pictures in 2014.